Because I am the only person left on the planet who had not watched the final season of The Sopranos (which is due to a variety of stupid reasons, mostly logistical), I spent all my free time the last couple of weeks watching these final 21 episodes. 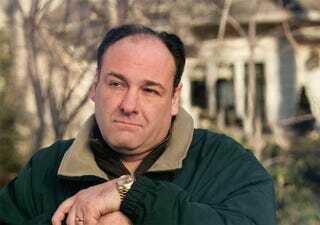 The whole season had a lot of enhanced meaning and weird double entendres since the great James Gandolfini is no longer with us. The fever dream coma episodes were so, so strange, when you think that the actor who played Tony is actually on the other side now. I kind of knew what happens in the last episode from reading about it, but the way it was done, and the minutest little movements leading up to that sudden cut to black... I don't know whether to cry or just bow down to the writers, or — what.